What follows is an excerpt from a letter sent by N. Foundoùlis, Greek consul at Sérres, to K. Paparrigòpulos, in the 19th of July 1884. 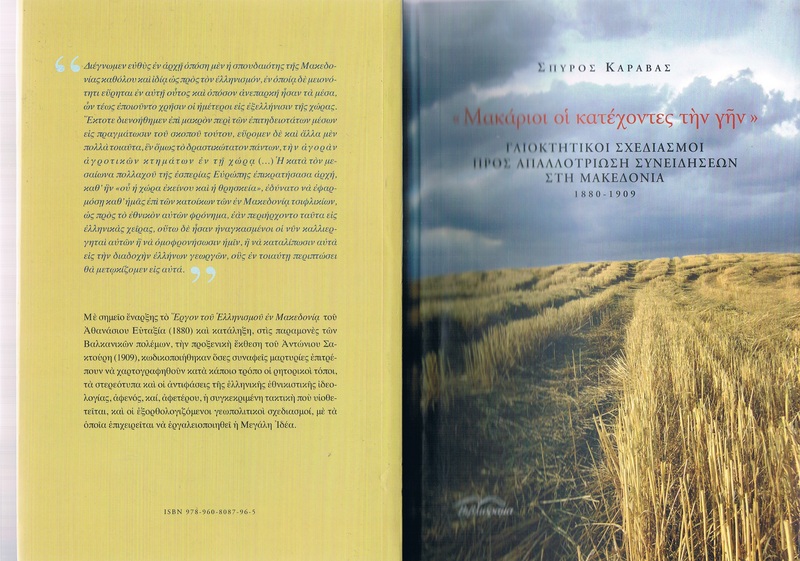 The letter is published in: Spyros Karàvas, «Μakàrioi oi katékhondes tin gìn». Gaioktitikoì skhediasmoì pros apallotrìosin syneidìseon sti Makedonìa, 1880-1909 [«Blessed are those who possess the earth [or: «the land»]. 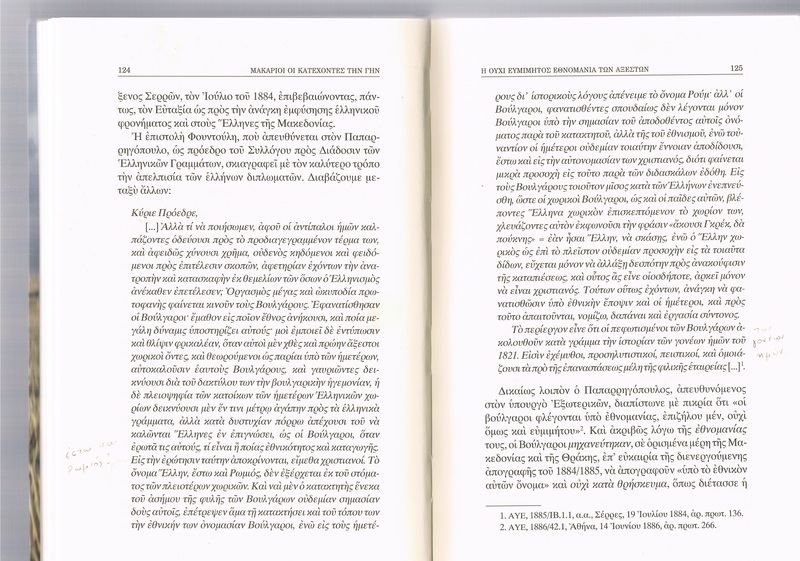 Real estate planning in view of alienating consciousness in Macedonia, 1880-1909], Athens, Vivliorama, 2010, p. 124-5. English translation: Akis Gavriilidis. It produces to me a horrendous impression and sadness, when on the one hand these people, being boorish peasants until yesterday and before that, and seen as pariahs by our people, now call themselves “Bulgarians” and boldly point with their finger to the Bulgarian hegemony, and, on the other hand, the majority of the inhabitants of our own Greek villages do show to a certain extent love for the Greek letters, but unfortunately are far from calling themselves Greeks in full awareness, as the Bulgarians do, and when one asks them who they are, or of which nationality or origin, in this question they answer “we are Christians”. The name “Greek”, or even “Romios”, does not come out of the mouth of most peasants. It is true that the conqueror, since the Bulgarian race was humble, paid no attention to them and, right after conquering their country, permitted them to use their national name “Bulgarians”, while to our people he allocated the name “Rum” on historical grounds; but the Bulgarians, having been strongly fanaticized, call themselves Bulgarians not only in the sense of the name given to them by the conqueror, but in the national sense, while on the contrary our own people do not attribute any such meaning at all, not even to their self definition as Christians, because schoolteachers did not insist enough on this. Such a great hatred has been inspired among the Bulgarians, that Bulgarian peasants, even their children, when they see a Greek peasant visiting their village, they mock him uttering the phrase “akousi Grek, da puknis” = if you are a Greek, shut up, while the Greek peasant most of the times pays no attention at all to such things, he only wishes to change his despot in order for his oppression to be alleviated, and let the new despot be whoever will come, provided he is a Christian. Things being so, there is a need for us to fanaticize our people from a national point of view, and to do that, as I see it, expenditure and coordinated work is required.